Physicians use exercise stress tests to evaluate how a patient’s heart functions with increased stress on the heart during exercise. 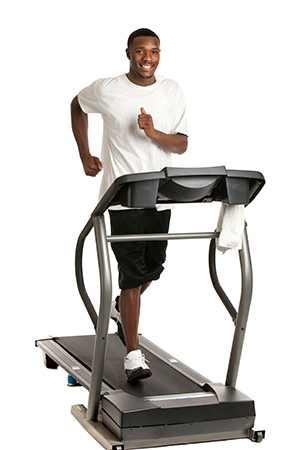 The test is performed with the patient walking on a treadmill to exercise the heart. The patient’s heart rate is monitored by electrocardiogram and can indicate if there is reduced blood flow in the arteries that supply blood to the heart due to a blockage. Exercise stress tests are used to diagnose coronary artery disease, heart-related symptoms like chest pain and shortness of breath, and to predict risk of heart attack. How is the exercise stress test performed? Patients are asked to refrain from caffeine intake several hours prior to the test. A technician will test the patient’s heart rate and blood pressure before the test. Electrocardiogram (EKG) leads will be attached to the chest to monitor heart rate, and status during the stress test. The patient’s blood pressure and pulse are monitored constantly throughout the test. The doctor can review your test before you leave to either reassure you or suggest if further evaluation may be necessary.